My two active boys really enjoy watching action and adventure shows so I was confident that they would enjoy watching the newly released animated movie, Slugterra: Ghoul From Beyond on DVD. 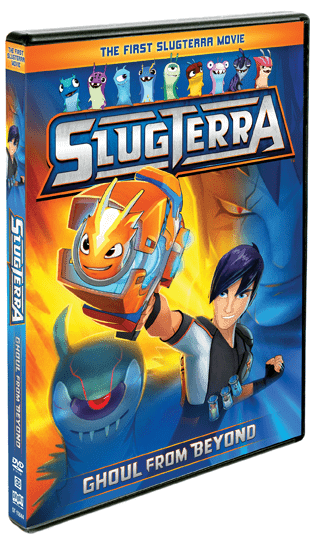 We had not yet seen the Disney XD animated television series, Slugterra which has been popular in both Canada and the United States. I am glad that we had the opportunity to watch this movie because we all enjoyed watching it together and look forward to checking out episodes of the show too. Slugterra: Ghoul From Beyond features Eli Shane who is the young hero that trains slugs in Slugterra, an underground world. Eli collects and trains a group of special slugs called The Shane Gang in order to protect Slugterra. In Slugterra, the tiny slugs have special powers to harness fire, water, air, earth, light, electricity, ice and more. My boys thought it was great when the slugs were able to morph and even mega morph into their most powerful forms when they are slugslinged. They especially liked the main slug named, Burpy who is just so adorable (from a mom’s perspective). In this movie adventure, the evil Dr. Blakk has been defeated by the heroes so Slugterra is enjoying the good times until a new threat comes from beyond the 99 caverns. Eli and the Shane Gang are ready for battle but are shocked to discover a new type of slug that doesn’t just have powers……he can do something remarkable that no one else has ever seen (or heard) before. In order to escape and save Slugterra, Eli and his group of slugs will need to win this duel by using all of their powers while working together to defeat the enemy. My children liked this movie because it was filled with action and excitement, had a good story line and the animation is excellent. It has a unique and creative plot and the slugs are fun and interesting to watch as the morph into their powers. I hope my grandson that is 10 years old that I have custody of and that has ADHA wins this he will love it! !